"Lodges - Cle Elum, Washington "
Past winners of the Bull of the Woods award from 1963 to 1965. 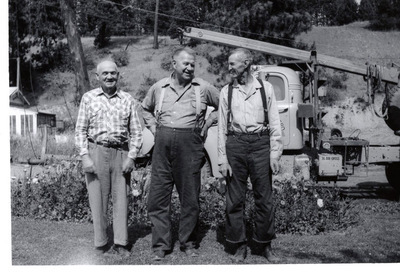 From left to right Eb Beattie, Elmer Renfro and Dominick Contratto. "Lodges - Cle Elum, Washington " (1965). Frederick Krueger Photographs. 524.